I remember enjoying Wonder Woman: Warbringer by Leigh Bardugo tons back when I read it. Not only because of the writing and the story, but also because of the idea behind the book. Was I thrilled when I found out there’d be more books by different authors? Of course! Was I going nuts when I found out the second book would be written by Marie Lu – who I adore ever since reading Warcross? YUP! Let’s ignore how I – once again – waited ages to actually read Batman: Nightwalker though.. I loved seeing Marie Lu’s view on Bruce Wayne before he became Batman. I really enjoyed seeing how he came to be into a position where he had to stand up and act a hero. Of course, I realize not everyone will agree with Marie Lu’s story, but that’s a very personal opinion any way. I enjoyed it but, in a way, I also had some issues with it – which is why this is mentioned.. two times! Yay! Read on! Once again, I do have to applaud Marie Lu’s writing as well. Although I had some issues – more about that soon – I enjoyed it. Her forte is definitely writing action-packed scenes because those grabbed me and didn’t me go – at all! But.. Apart from those scenes? I did feel like everything went so slowly and.. I felt bored at times. It took me over 100 pages to get into the book. Not to mention how, every time I needed to stop reading for a bit, it took me a fairly long while before I was immersed in the story again. I don’t think I ever had that with previous books of hers I read, to be honest, and it was such a pity too. Definitely frustrated me at times. I wanted to give this all the cupcakes, but I just can’t because of that. Also because of how.. obvious a lot of things were to me. I didn’t feel like I had to read the entire book because I already had a huge feeling about what was going on, what was going to happen and how the puzzle pieces would fall together. I ended up being right about everything and.. well.. that’s not what I wanted, you know? The blood just pooled beneath him in a perfect circle, like a disk of smooth frosting on a cake. Then going back to how Marie wrote Bruce’s story.. I enjoyed it, sure, but looking back the plot definitely isn’t up to her normal standards. It all feels way too unrealistic – how a rich kid ends up moping the floors in the city’s worst asylum? How they let an eighteen-year-old talk with someone who’s admitted to murdering three people? It’s all a bit too much, if you ask me. Sure, they were some pluses, but those feel minor compared to the issues I had with this story, which is why.. I’m going with a “meh” rating. 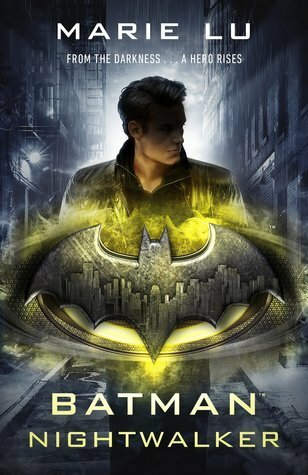 Have you read Batman: Nightwalker? How did you feel about it, compared with Marie Lu’s other work? How do you feel about superhero stories in general? Like? Dislike? I loved it right after finishing this book, but took reflecting, it really is pretty mediocre. A 3.5 Star read for me. As you said, the scenarios are far too unrealistic. Great review! I feel you. I just went with the drastic mediocre feeling I was having by giving it 2.5. I simply had.. other expectations for this one. Completely agree that this book was slow! It wasn’t very long but took me forever to read lol and it’s probably my least favorite of all the ones that have been released. I’m a bit skeptical, going into Superman as he’s never been my favorite. Right?! Catwoman: Soulstealer is definitely my favorite so far! I flew through that one and I’m happy too. I was actually scared it would disappoint me after this thing with Batman, hah. I don’t think I’ve ever even heard of the author who’s writing Superman? So I have no clue what to expect whatsoever. Me either so I feel like I'm going in kind of blind lol. I liked it….but I didn’t love it….. Thank you! 🙂 Definitely liked Catwoman: Soulstealer better than this one though. Not that I should’ve expected anything else since Maas wrote it, but hey.